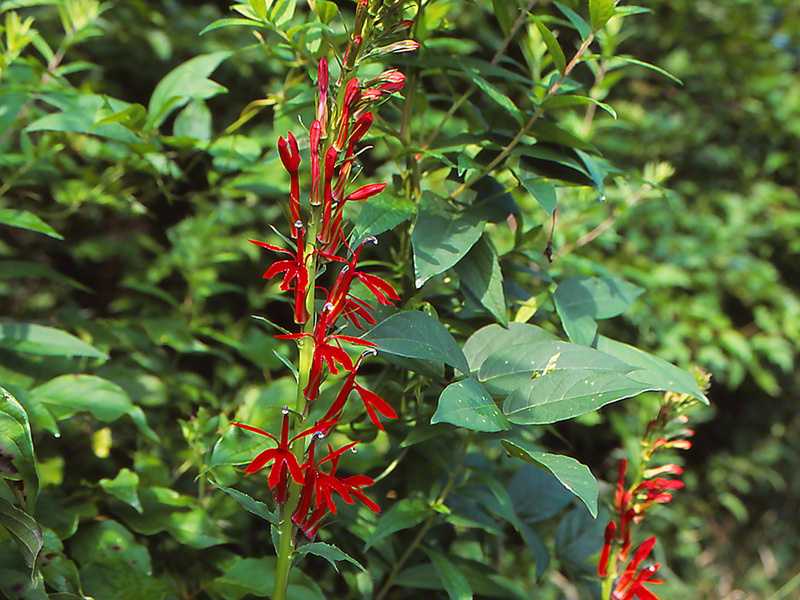 I find that Lobelia Cardinalis is quite disarming. Working my way along a small pond in Rector, Pennsylvania, there it was. I don’t know about other men, but a certain red lipstick and these spectacular wildflowers evoke the same OOOh! I also notice that all heads turn when a handsome male Cardinalis Cardinalis bird posts itself on a nearby branch. A wetland plant, this relative of the Lobelias that we might buy at the local excellent nursery can be found in most states. The flower’s nectar must offer a cocktail of nutritious sweets; as hummingbirds favor these brilliant red blooms. Do butterflies? I have seen Eastern Black Swallowtails drink the flower’s nectar, and are able to overcome the challenge of the length of the tubular flowers. One day I must return and park myself on a folding chair and photograph an Eastern Black on a cardinalis bloom. The above is solely a clinical observation of the flower’s physiological effects.